Collegewise is offering a series of webinars for students, parents, and counselors. The schedule and the links to register are below (I’ll be presenting the August 22 college essay session). 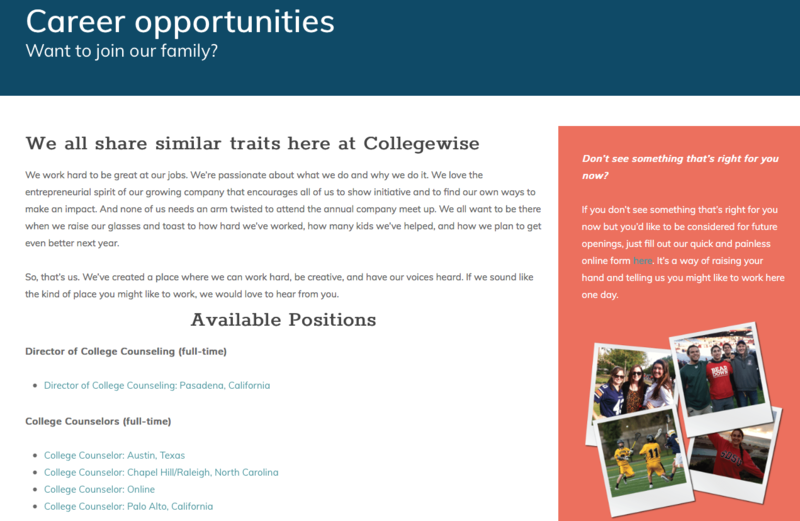 Earlier this month, I shared my plans to rewrite the Careers page of our Collegewise website. What felt fresh in 2006 felt dated today, and it reminded me how powerful it can be to take a new, critical look at things you’ve long since stopped evaluating. Here’s a screenshot of the old page. That was who we were then. All those words are still true. But Collegewise has grown and evolved since then. We needed to give potential Collegewise applicants the most complete, honest portrayal of the place they’d be joining if they came to work here. We’re not just deciding if they’re right for us; they’re also trying to decide if we’re right for them. And the old page just wasn’t giving them enough information to make that call. So here’s the new page. It talks a lot more about who we are and what type of person is most likely to be happy and successful at Collegewise. It explains our culture and what it’s actually like to work here. And most importantly, it features the part of Collegewise we’re most proud of—the people, the way we work together, and the comradery that not only makes us happier employees, but also helps us be even better counselors. All of these principles take a page out of how we’d tell students to present themselves in college applications. Be honest. Be proud of what you’ve accomplished. Clearly present the most important information. And focus on who you are today, not on who you were many yesterdays ago. Our new Careers page won’t resonate with everyone who comes across it. And that’s fine. Like colleges, we’re not the right fit for everybody. But now we can be sure again that those who our page resonates with will be responding to the Collegewise we are today. That was us then. This is us now. If you know someone who might enjoy working at Collegewise today, please send them the link to our Careers page. If we end up hiring them, we’ll pay you $700 after the person completes three months of successful work. In March, I announced that we’d hired a full-time filmmaker at Collegewise, Frank Martinez. Yesterday, Frank released his first official finished product with us—a recruiting video entitled Life at Collegewise. Our offices were buzzing with pride and praise for how well he captured just who we are and how much we love the company we’ve built together. We’re currently hiring in six locations nationwide, and we have one online position for a person who could live virtually anywhere. If you or someone you know is looking for an opportunity to learn and grow as a college counselor, to make a difference for kids and parents, and to do it all with smart, passionate, supportive co-workers who bring their hearts to work every day, I hope you’ll consider joining us. Let’s make a dent in the college admissions universe together. You can find all the information about us and our open positions here. 1. 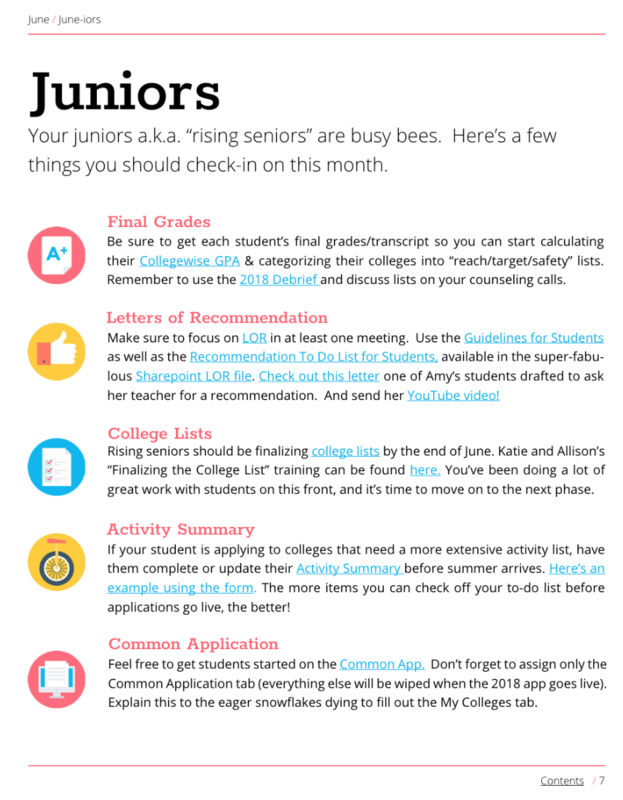 What should you be doing for each grade level of your Collegewise families this month? 2. What should you be doing to improve your office and your counseling this month? 3. Do we have any helpful materials or guides to help you accomplish these things? 4. Any relevant timely tips from Collegewise veterans? For example, here’s a screenshot from one edition. Inside the Hive has become one of the most vital tools we use in our work. College counseling can be a complex business. It’s not always obvious where to focus our time, how to adopt the techniques of the greats, or what resources are already available so we don’t create a new version unnecessarily. And our counselors don’t sit in the same building. Collegewisers in Los Angeles, Austin, Columbus, New York, etc. don’t always know what their far-flung colleagues are up to like we would if we all worked in the same building together. But once a month, we put all the most vital and useful information in one place. Do what Inside the Hive recommends, and no counselor has to wonder if they’re focusing on the wrong things or somehow missing something. What would a company, school, club, or organization’s version of Inside the Hive look like? What if you committed to sharing the most important to-dos, advice, resources, etc.? In the ensuing years, you can revise and update it. But you’ll probably only need to write each issue from scratch once. What were the most important things I did each month? What specific monthly advice would I give someone (or myself) next year, knowing what I know now? What resources or other helpful information did I use, and what else would have been helpful to have on hand? Repeat that a few times throughout the year and you’ll have retroactive issues for every month. Then next year, just unearth the appropriate issues at the appropriate times. Big or small, everyone in the group gets better when you carve out time to advise your hive. The most important job of a college counselor is, not surprisingly, college counseling. Sitting down with families and helping them manage a more successful, more enjoyable process isn’t just what people hire us for; it’s also what we do best. But we can’t meet with students all day because they’re in school. And our busiest time—“Senior Season,” as we call it—runs from July-December. So during the spring, we spend as much time working on our business as we do in it. Every two weeks, I send an email to everyone in the company asking one question: “What are you working on?” People who want to answer (participation is always optional) fill out a quick survey, and all the answers are shared with the entire company the next day. This has nothing to do with managing people or watching over them to make sure they’re working. Sharing what we’re all up to is one small way to help us feel a little more connected. We don’t all work in one building with each other. Our counselors are spread out all over the country and even internationally. But our regular work sharing lets us draw ideas and inspiration from each other. And if we see something that looks interesting, we can try it ourselves, or reach out and offer to pitch in. Below, I’ve shared some sample responses from last week. Some are short, some long, some straightforward, some with levity—we don’t mandate how people should respond. And this is one of the few times when we don’t want to be sticklers about great writing. The key is for each coworker to have an opportunity to share whatever work update they’d like to share. Schools, departments, clubs, organizations, businesses, etc.–we all get busy. We all struggle occasionally just to get the job done like we’ve been hired to do. But whenever you can, give yourself and everyone else the time, space, and opportunity to take on other projects, to improve, push, initiate, or otherwise go beyond what they’re hired to do. Work on your business rather than just in it, and you’ll probably be better—and happier—doing the jobs you were hired to do. Speaking at a middle school, speaking at a college fair, speaking at an art consortium, then taking a break from speaking until May. Also onboarding our new counselor and hoping I don’t scare her away! I am working on setting up our relatively new conference room for a presentation next week, editing activity summaries, sifting through the 2017 debrief to make it useable for everyone, and setting up our summer seminar series. Woot woot! Hiring. We are still on the phone interview stage over here. Moving my office. Slowly building lots of IKEA furniture between student meetings. Eventually getting rid of my old furniture (which was just mine from home). Writing three months of the CW parent newsletter, the one we send to enrolled families. Prepping to present twice (two days, two topics) next week at the New Jersey NACAC college fair in Secaucus—the biggest college fair in the state. Prepping to present next week (on the same day as one of the college fair presentations!) at a local private high school. Meeting with my juniors, finalizing lists, and activity summaries. Meeting with sophomores who are starting college research. Meeting with freshmen who are wrapping up course planning and confirming summer plans. Signing lots of new underclassmen. Scheduling a few summer seminars. Trying to find time to write part of the nursing guide, but slipping on that for sure. I’m LOVING having a partner in crime with the addition of our office’s new counselor and all the fun stuff that comes along with an expanding office. Preparing with the amazing 301 webinar team (there is going to be some meaty stuff for everyone—shameless plug for the May 3rd webinar–DON’T MISS IT!!! )… Working hard to start finalizing some of my 2018 kids’ lists and putting essay brainstorming meetings on the calendar. I am hosting a counselor luncheon on May 9th. So right now I am just monitoring the registration and making plans for a final RSVP push. I am also gearing up for a few seminars during the next three months beginning this Sunday. I am also hiring a Community Organizer (yay!). Lots of speeches, getting ready to present at the TACAC/SACAC/RMACAC Superconference, looking for a co-working space, and a couple of introductory meetings, too. Quite a lot of speeches at night, but the bulk of my time is spent addressing the questions and concerns of my colleagues. I also write many emails that contain nary an explanation point while contemplating our ongoing path to global admissions dominion. Then I have tea. Outreach! I’m excited that I’m in the process of setting up a formal relationship with the public library that will include seminars for students and families, and possibly training for librarians. Prettifying our office for our new addition (she starts in June!). Hitting the financial outreach hard this week and meeting with financial advisors, banks, and equity firms about collaborative seminars and potential partnerships. Stalking my seniors about final decisions and sending out testimonial requests. Moving juniors to final lists and taking photos for our senior wall (how is this happening already?!). Administering the employee engagement survey (please take yours if you haven’t already), preparing for upcoming management trainings in Seattle and NYC (East Coast bound! ), updating some recruiting, hiring, and training resources, and drinking significantly more coffee since the arrival of kid #2. With March SAT and April ACT scores available, the name of the game is Reach, Target, Likely/Safety lists! Also, preparing for Casey’s arrival and the 3rd office expansion! I’ve had an ongoing project trying to get Yelp pages set up for all of the brick and mortar offices around the country. More and more people are using Yelp as a modern Yellow Pages, and we want to ensure that our contact information is correct in all of our various markets. Getting Yelp to assist us with this has proven much more difficult than anticipated. Next week is finally training week and I’m very excited to meet all the other new Wisers from across the country. I just posted 2 new seminars that I’m excited about. Now, I’m working on getting them filled! I am really excited to be pulling together the training for our new assistants and have enjoyed the process even though I have emailed Allison about it approximately 732 times. Also, getting my new counselor up to speed! It’s her first week and she’s handling it like a champ so far. She hasn’t run screaming from the building and her head hasn’t exploded from information overload (yet). If you other recent newbies want to give her some love and a pep talk, please do! Two big things: revamping essay training materials, and starting the hiring process for new editors and proofreaders. Yay! Training, training, training… Trying to learn all that is Collegewise! Currently staring at Kevin’s face on the on-demand training videos while I learn about intro meetings. My brain is on overload, but I am liking what I hear and am more affirmed I am in the right place! Hope to add to the awesomeness that you all already bring to the program! Creating a one-man video production studio from scratch. I’m in concurrent pre-production on several video projects that will go public in mid-late June. You’ll start to see teasers in May. Working out visits to film in Austin and NY/NJ/CT, interviews with the leadership, and I’m looking for filming opportunities to film students/parents with some help from you guys. Working up several “pilot” projects for what will be a rich content stream on YouTube and Instagram, probably featuring y’all giving tips/advice/wisdom on all things college admissions. Bouncing ideas off leadership and counselors to make sure our content reflects the awesomeness within. Want to attend college outside the US? Updated 4/18/17: I wrote in my original post that this webinar was free. That was my mistake–we’re charging $10. I promise this wasn’t my attempt at a blogging bait and switch (though my lack of attention to blogging detail is almost as frustrating). Thanks for being patient with me. We’re increasingly hearing from families with students who are considering attending college outside of the US. From reduced tuition, to cultural immersion, to fulfilling a sense of adventure, there are many reasons why a student might look to spend four years beyond US borders. If you’d like to learn more–not only about the opportunities, but also the process of applying and getting accepted to international colleges–I hope you’ll join us for this upcoming webinar. All the details, and the link to register, are here. Our new filmmaker is here, and soon to be filming! This week, Collegewise welcomed our new full-time filmmaker, Frank Martinez, to the family. We got over 70 applications for the position, we narrowed it down to three applicants, and we extended one offer—Frank’s. 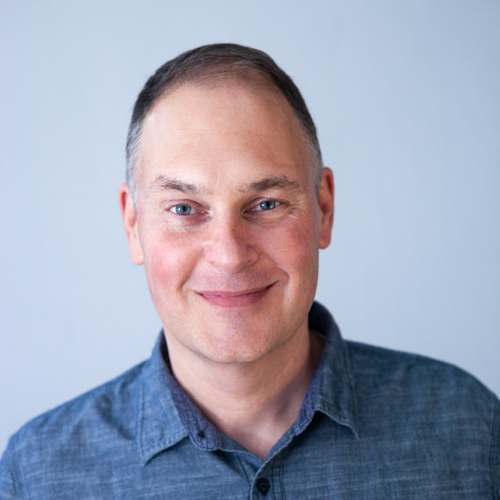 There are some important lessons that applicants to both jobs and colleges can learn from the way Frank approached this recent hiring process with us. And none of them require that you necessarily know how to capture good footage. Frank didn’t apply for a job—he applied for our job (in fact, his former high school guidance counselor reached out to him and recommended he apply). Our job posting, mission, and culture intrigued him. He really felt he could do great work here, and he explained why throughout the application process. It’s entirely possible that Frank was applying elsewhere, too. But every interaction he had with us demonstrated that ours was a gig he wanted. Hiring and college admissions can seem impersonal. And sometimes it can be, especially at the largest institutions. But more often than not, a human being is reading that application, and they’re doing so to find not just the right employee or student, but also the right human being to join the group. The best way to prove that you’re a good match with a company or a college is to start by picking companies or colleges that are actually good matches for you. It takes effort to seek and communicate the fit. And Frank’s application had effort all over it. He wrote a personal cover letter just for us (a fantastic one, by the way). He’d taken the time to read not just our post, but also our website, many of our blog articles, and our Five tips for job seekers. During our interviews, he had thoughtful questions and ideas that showed just how much time he’d spent learning and thinking about us. I know it’s tempting to treat applying like a numbers game where you hope to improve your odds of winning by simply playing more often. But sending the same impersonal, recycled materials makes you look lazy. Not bothering to follow the application instructions makes you look lazy. Asking questions that are clearly answered with even a cursory review of the website makes you look lazy. Effort, on the other hand, always stands out. Great filmmakers have a body of work, one that they can share through the wonders of the internet. Frank’s films did more than get my attention. They moved me. They made me want to keep watching and to learn more about the subjects. He didn’t have to talk about his work—he could actually show it to me. Not all applicants applying for jobs—or students applying to college—are doing so in fields where they can post the work itself online. But what could you point to as evidence of your work and its impact? Maybe you created a new training program to bring new employees up to speed? Maybe you rewrote and redesigned the organization’s website? Maybe you ran a fundraiser that got new uniforms for the high school basketball team. When you can point to, post, or otherwise share not just what you did, but also the results of your efforts, you’re likely doing great work and making an impact. Before Frank started, I asked him to make a short video that we could share on his first day introducing himself to everyone at Collegewise. Creating a short, entertaining video is not a difficult assignment for a great filmmaker. But finding the right tone and approach that will resonate with nearly 50 people, most of whom you’ve never met or even spoken with, on your very first day of work—that is not easy. But Frank took the project on and made something smart, endearing, and just plain good–a video that all the Collegewisers seemed to agree proved that he’ll fit in just fine here. Here it is. We’re excited to have Frank with us, and as he begins to capture more about Collegewise, I’ll share some of his great work here. We’re trying an experiment in our Southern California offices. Collegewise counselors do almost all of their own work. They don’t just meet with families, help build the college lists, and manage the application process to make sure everything proceeds smoothly and thoughtfully. They also book their own appointments, do their own follow-up with families, field their own reschedule requests, track their own work, and do just about everything else that comes up during the course of their days. But what would happen if they could focus more on just the counseling, the parts of the job that they’re uniquely qualified for and trained to do? Would it be better for our customers? Absolutely. Would it be better for our counselors? It certainly seems like it to us. Would it be better for our company? If it means happier customers and happier counselors, we’re willing to try it. So we’re hiring full-time executive assistants in our Southern California offices located in Irvine and Mission Viejo (both are in Orange County). All the details are here. If you or someone you know might be interested, the instructions to apply are in the post linked above. I hope we’ll hear from you.